I love micro hydro. When done the right way, it can be environmentally friendly, have minimal ecological impact, simple, efficient and robust. My first job in renewable energy was with Smart Hydro Power, a German company selling 1m diameter floating river turbines which generate up to 5kW of electricity. It’s an exciting industry with a really nice work environment (who doesn’t like hanging out by lakes and streams?). I recall when I was trying to enter the renewable energy industry after high school, I received a well thought out response from one of the senior managers of a local firm. One of the lines in my application voiced my opinion that solar is the way of the future, to which he responded saying solar indeed has great potential but it’s important that we use a variety of renewable energy sources as we transition to a more sustainable future. What’s important is to utilize the resources around you and not create blanket solutions – it’s standard intelligent design really. So where does micro hydro make sense? British Columbia has 1,955,540 km of rivers and streams and the majority of the province is mountainous. Alberta may have more sun, Saskatchewan may have more wind, but BC has incredible micro-hydro potential. Of course, this isn’t new news given that 90% of BC’s electricity is from hydro dams, but there’s more to hydro electricity than megawatt scale dams. The smallest hydro turbines are often hydro-kinetic – think underwater wind turbine. As the name implies, these turbines use only the kinetic energy of the flowing water and no vertical head is required. They are the least disruptive of the local environment but require faster flow speeds because they only use the kinetic energy of the water and not the potential energy. Another unique application of hydro turbines is in existing piping systems. This could be sewer lines, industrial processes or supply lines where the source is higher than the destination. 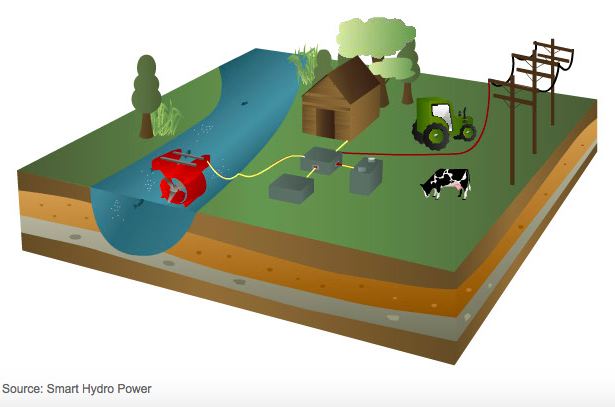 The same technology used in run-of-river projects can be used to produce electricity from otherwise wasted sources. Electrically, micro hydro is a really nice fit for off-grid situations because of the consistency of the power. With a constant supply of electricity, the size of the battery bank (which often accounts for 30-50% of an off-grid solar install) can be greatly reduced. Grid-connected systems are perhaps less dreamy (everyone likes the off-grid cabin in the woods next to the stream, right?) but can be a great fit under the right conditions. The last element to note when considering micro-hydro is the permitting process. The number of permits and environmental assessments necessary will vary greatly site to site depending on size, ownership, type of installation, location and local ecosystem. Like the rivers and streams themselves, micro-hydro projects do not come and go overnight. They take time to develop and, when done right, last a long time.